Today is Tortilla Chip Day. Obviously the quickest way to make tortilla chips is to go buy some tortillas, cut them into wedges, and cook them. But you all know me well enough by now to know that that just wasn’t going to cut it – at least not on a weekend day when I actually have time to do more. So first thing this morning, when I got up, I made some tortillas. 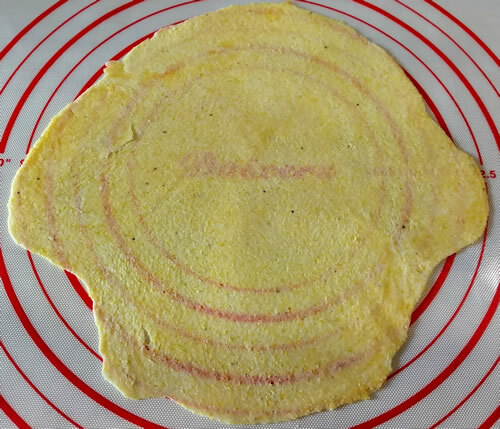 I know that technically tortillas are either flour *or* corn, and this recipe combines them, but it sounded interesting, so I figured why not. You mix up the dough and then divide it into 10 balls and let them sit for half an hour to rest. This gives the cornmeal time to soak up some of the moisture. Then you roll each little ball into a roughly 8 inch circle. My circle-rolling skills are not fantastic, but I did my best to get them reasonably well shaped. They are, by the way, rolled *extremely* thin, as you can see. Next you cook them in a hot, ungreased frying pan for about 45 seconds per side. 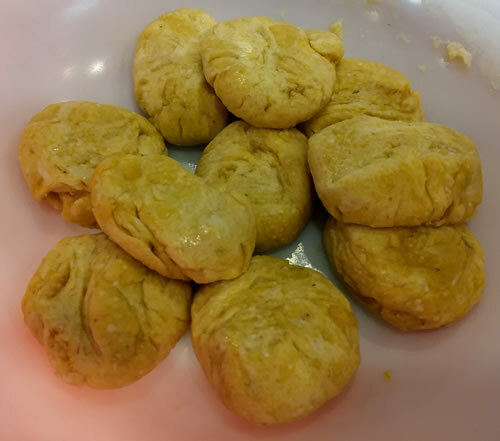 Of course, then while putting them into the pan, they had a tendency to wrinkle up, and lose their shape, so my inability to roll things into a perfect circle didn’t really have much bearing in the grand scheme of things anyway. A pile of finished tortillas. 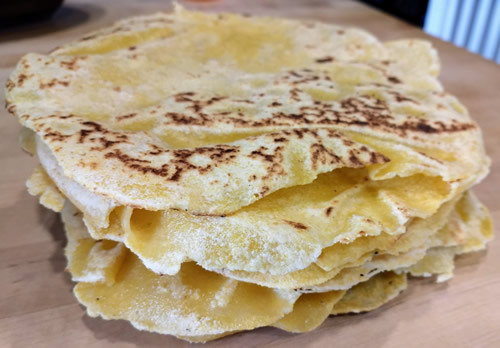 These aren’t a flexible tortilla (I’ve made flour tortillas before, which turned out soft and pliable); they’re more a bit stiff and slightly rubbery. I suspect if I’d cooked them a little less per side they’d still have been soft, but that’s okay, because soft isn’t the ultimate goal for today. 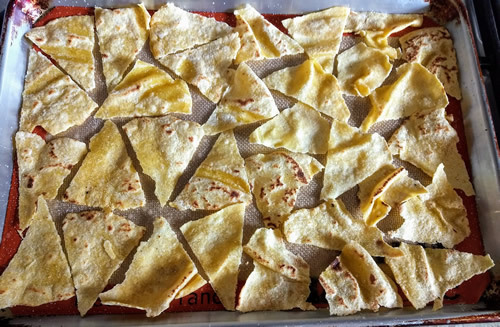 Once the tortillas were all done, the next step was to turn them into chips. I cut each into 8 wedges, then spread those out on a baking sheet, gave them a quick spritz with some nonstick spray, and a liberal shake of salt, and tossed those into the oven to bake until crispy. 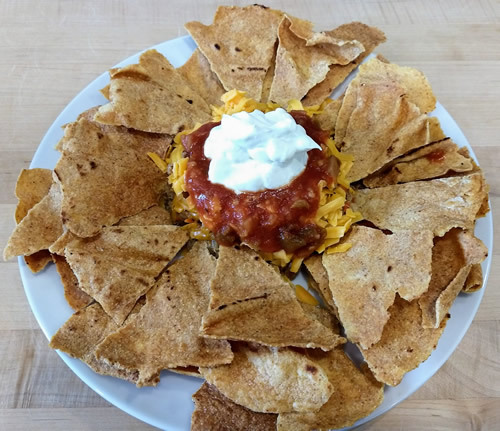 And what better way to enjoy my slightly lopsided homemade tortilla chips, than with some nachos! We pulled a bag of pulled pork out of the freezer and topped it with some cheese and salsa and sour cream, and then dug in. Verdict: These were absolutely delightful. They’re a bit more fragile than the ones you buy at the store, possibly because they’re baked and not fried. The chips were crispy, but still had that slight grit that you expect from a corn tortilla chip, while crumbling nicely in the mouth. Would I make them again? Maybe. It’s a bit of work to do all the steps, and we don’t actually eat chips all that often, but I’m not ruling this out, next time I have a couple hours to spare and we have the urge for something with a bit of crunch.